How do Prince Louis' first photos compare to Prince George and Princess Charlotte's? 2018 is well and truly Royal Christmas all year round! Between the two royal weddings and the new prince, there's something exciting to celebrate every day. And this week, fans are in Royal Baby heaven with the palace releasing a stunning set of new photos to mark Prince Louis' recent arrival last month and Princess Charlotte's third birthday. 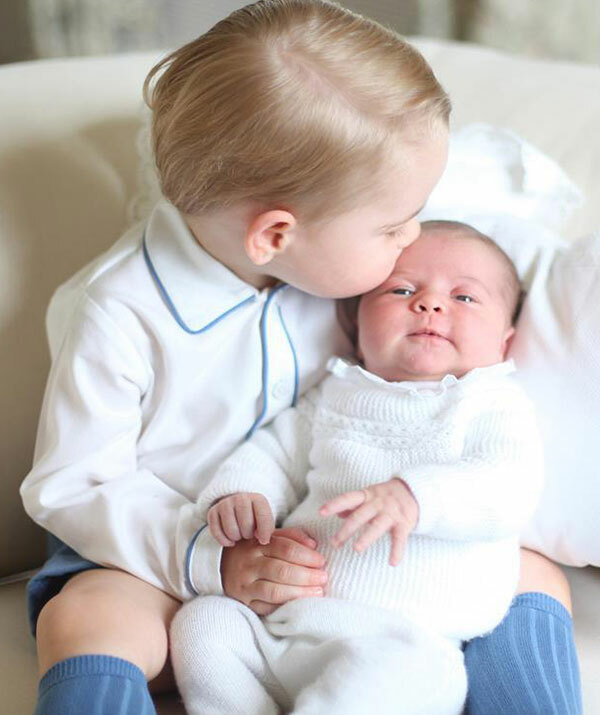 While we pour over the perfect new pics, (seriously, Charlotte kissing her baby bro is just too much) we can't help but wonder how Prince Louis' first photos compare to Prince George and Princess Charlotte's? After his grand arrival on the 22nd of July back in 2013, the world couldn't wait to be given another glimpse of Prince William and Duchess Catherine's son. And we didn't have to wait long, with the palace sharing two heartwarming first family photos on August 19th. It was indeed a sign of Wills and Kate's very modern and down-to-earth approach to parenting, breaking with tradition the dressed-down royal couple posed in the back garden of Kate's parents' Bucklebury estate. Just like Louis, Prince George was fast asleep as he made his family portrait debut! In yet another nod to their casual approach, the Cambridge's pet pooch Lupo and the Middleton's dog Tilly both made an appearance and instead of using a well-known professional snapper, the pic was captured by Kate's dad Michael Middleton. It made for a refreshingly normal look into the lives of the modern-day royals and set the tone for future family photos. Interestingly, it was the only time William and Catherine have made an appearance in their child's first photos. Since George, the parents have instead opted to let another child take centre stage with the newborn. This photo was set in the Middletons' sun-soaked back garden in Berkshire. Kate's dad Michael captured an intimate moment of a sleeping George cradled in his mum's arms with William by their side. Also making the shot were the family pets Lupo and Tilly (far left). A sleeping babe in arms: Like his big brother, Prince Louis caught some shut eye. The proud parents pose in the backyard with their first-born, Prince George. This time around, the palace gifted the world with four new pictures of the perfect princess a month after her May 2nd arrival. Prince William and Duchess Kate were more than happy to throw out the royal rule book! Just like with Prince Louis, the images of Charlotte were taken by Catherine in an informal setting on the couch. Once again they showed a softer, more down-to-earth side of the Cambridge clan. 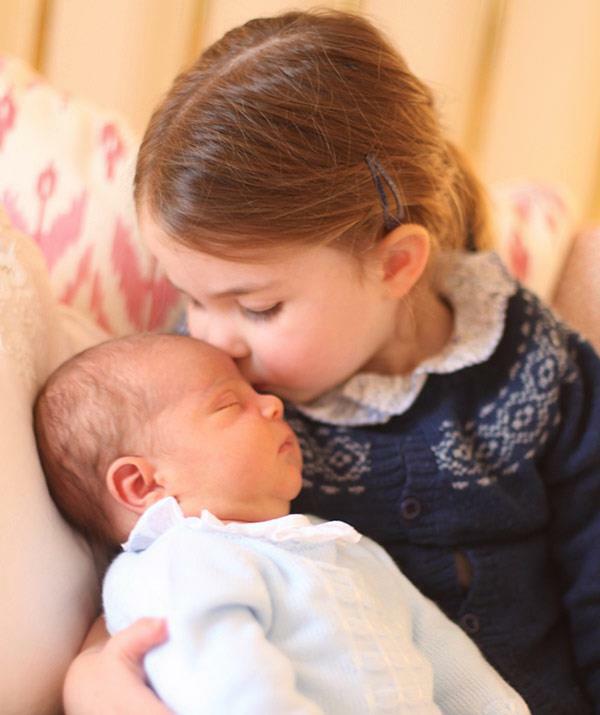 Slide across to see Princess Charlotte as a newborn with big brother George and then three years later, she recreates the moment with the royal's newest member - Prince Louis! The beautiful shots, which were most recently been recreated by Charlotte and Louis, showed big brother George gazing lovingly at his new sister as he holds her. The pair looked adorable in matching white outfits - George smart and dapper in a pair of knee-high baby blue socks, matching shorts and a crisp white shirt with a blue outline, while one-month-old Charlotte was rugged up in a knitted jumper and cosy pants by Irulea. Coming full circle, Prince Louis re-wore Charlotte's Irulea threads in his first photos this week. Proud big brother Prince George bonds with his baby sister at Anmer Hall in Norfolk. Three years later, Louis re-wore Charlotte's outfit. Who does Prince Louis look like most? With his button nose and bow lips, Louis reminds us a lot of Princess Charlotte. But let us know what you think, you can drop us a comment on Facebook or join our Royals' Facebook group here! (L-R) Prince George, Princess Charlotte and Prince Louis as newborns.